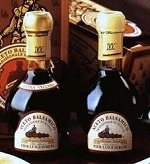 Highly-prized wines and liqueurs of every kind are also joined by the renowned products of "Acetaia Sereni" (Marano sul Panaro, near Modena), first and foremost its "Balsamic Vinegar" - made through slow fermentation and subsquent vinegar-conversion of the must of the Trebbiano grapes grown around Modena: it is "brewed" with direct heat, without adding any other substances, and left to age in precious wooden barrels (oak, mulberry, juniper, chestnut). This ageing process lasts for at least 12 years (white cap) but may even last for 25 years (gold cap). The range from "Acetaia Sereni" is even broader!